Some good news for fans of Marvel’s Agents of SHIELD. ABC has renewed the Tuesday night TV series for a fifth season. Part of the Marvel Cinematic Universe, the action drama follows Agent Phil Coulson (Clark Gregg) and his team as they investigate the new, the strange, and the unknown across the globe, protecting the ordinary from the extraordinary. The cast also includes Ming-Na Wen, Brett Dalton, Chloe Bennet, Iain De Caestecker, and Elizabeth Henstridge. 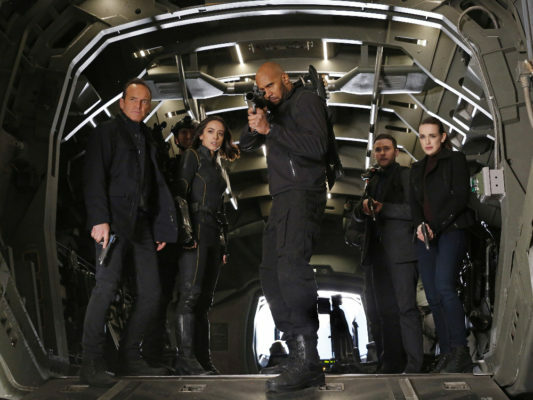 Over the past few seasons, ratings have dropped considerably for Marvel’s Agents of SHIELD. Currently, season four is averaging a 0.74 rating in the 18-49 demo and 2.35 million viewers, making it one of ABC’s least-watched series for the 2016-2017 season. Nevertheless, ABC has decided to stick with the show, which is lucrative for both the network and the Marvel brand. What do you think? Do you watch Marvel’s Agents of SHIELD? Are you glad it’s been renewed for a fifth season or, do you think it should have been cancelled instead? Thank-you ABC for renewing the show for season 5. We both have followed and enjoyed the show from the start. I’m so glad to hear that season 5 is coming. I’ve watched this from its first airing and am an aved watcher. Thank you from the fans. I’m very glad ABC kept Marvel’s Agents of Shield. I’m a Marvel fan & I really like this show! Im glad it has been renewed. I hate that we get into these shows and they get canceled. I binge watch these shows off of Netflix because no one really wants to wait for week for the next episode, only to find out they are being canceled due to low rating . I bet if you could find out the ratings on Netflix they wouldn’t cancel or would renew for new seasons. Glad to hear of renewal. Story line just getting interesting. Look forward to see where it goes.